This past weekend, my wife and I took a trip out to Sandy Point State Reservation on the southern tip of Plum Island. The impacts of Hurricane Sandy and the recent Nor'easter were clear. The small dune that I found this flock of plovers taking refuge behind in early October is no longer there, as the beach is now one large flat expanse. It's fascinating to see the power of nature, and this was a prime example of the ephemeral existence of the beach environment. 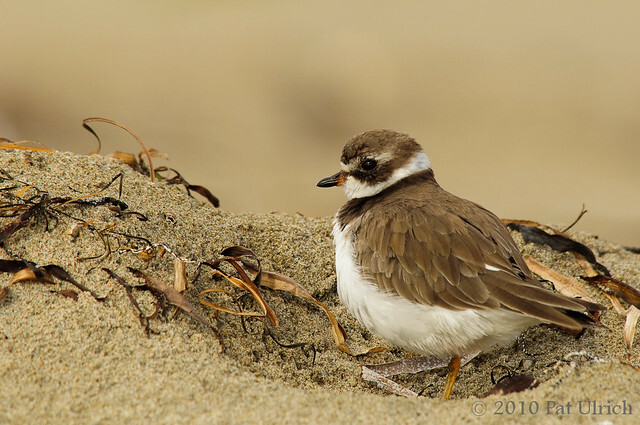 View more of my photos of plovers. 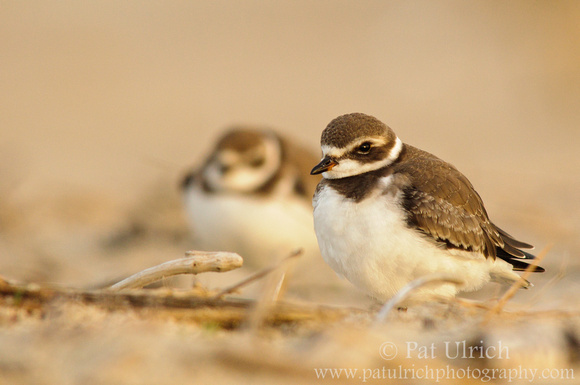 I had a lovely encounter with a flock of semipalmated plovers at Sandy Point State Reservation on Plum Island a few weekends ago. The late afternoon hours were mostly overcast, but as the sun crept towards the horizon, its last rays lit up the clouds and cast a beautiful golden glow over the birds. 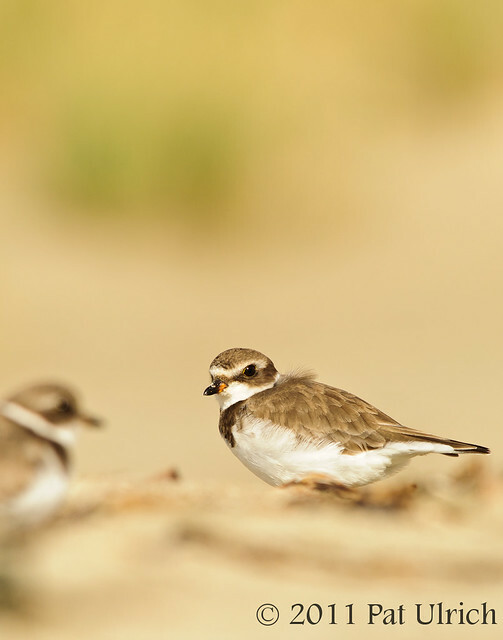 View more photos of plovers. When I have a cooperative subject, I try to remember to turn the camera vertical to get some variation into my images for the day. 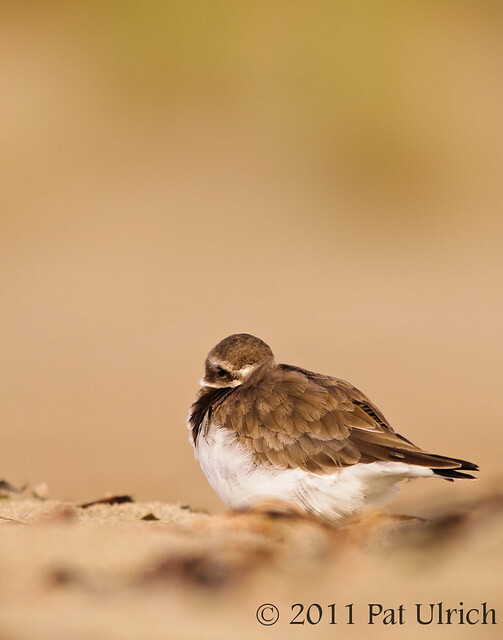 While shorebirds like sandpipers and plovers aren't always the best shape for taking advantage of a vertical frame due to their low height and stocky stature, it's still worth taking a look. 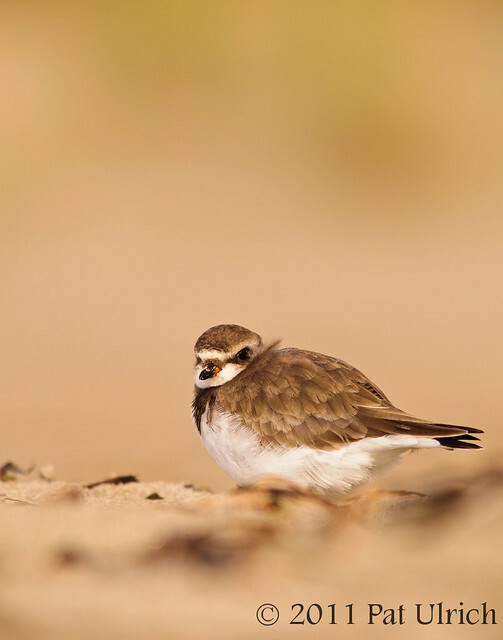 In this situation, the apparent shallow dof I could get by using the sand in the foreground and the long distance to the dunes in the background helped to make an isolated environment for the plover, and it worked much better in the vertical for this purpose. While I enjoy a good photograph of a bird tucked into its feathers, sometimes they can lack a little something when an eye isn't clearly visible. The shot above is from just after it pulled out of its resting position to take a look around, and the frame below is from a bit earlier while I was watching this group of birds. The sun was bouncing behind clouds, giving a good mix of diffuse overcast light with a touch of sunshine every now and then too. 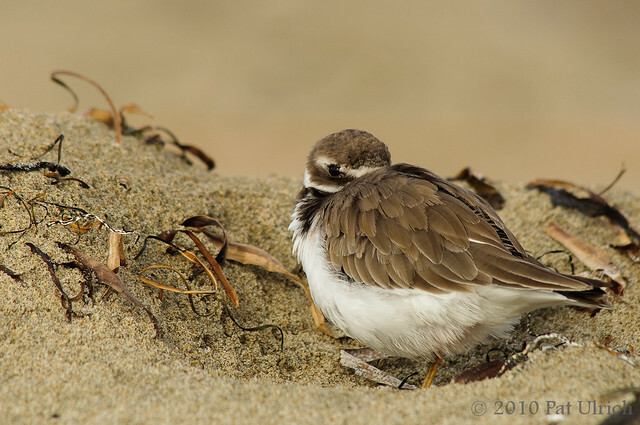 See more of the semiplamated plovers and other species in my Plovers Gallery. 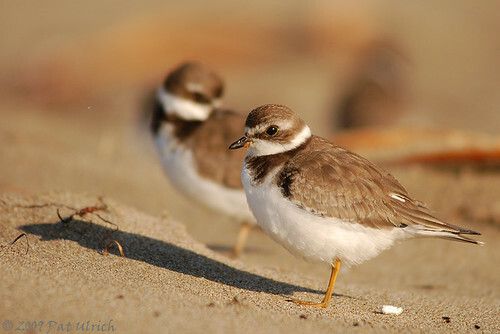 Before I saw the huge flock of sandpipers flowing along the beach at Limantour Spit in Point Reyes National Seashore, I had a wonderful encounter with 15-20 semipalmated plovers on that same stretch of beach. It was a great time of day for shorebird photography -- mid-morning with a rising tide. All of the shorebirds were more interested in napping and preening than running around and feeding. They likely spent the early hours feeding on the estuarine mudflats during low tide, and then were ready to rest and digest on the beach. It seems like everyone is getting into the blogosphere now, and I suppose its finally time for me to give it a try. I've been posting my nature and wildlife images to Flickr for a few years now, and have built up an archive of around 700 images as of this posting. While I enjoy the community that Flickr offers, I also often have more to say of the story that goes into the pictures I take, and I feel like a blog is a better place for that to be. 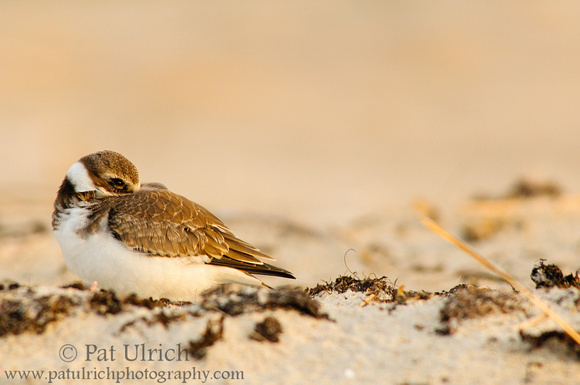 Since shorebirds are my favorite subject, it seems appropriate to use them for the inaugural image. 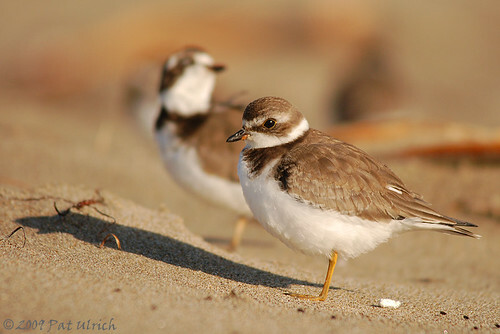 Here's a pair of semipalmated plovers along Limantour Beach in Point Reyes National Seashore. What I love most about this image is the expression of the bird in the background. 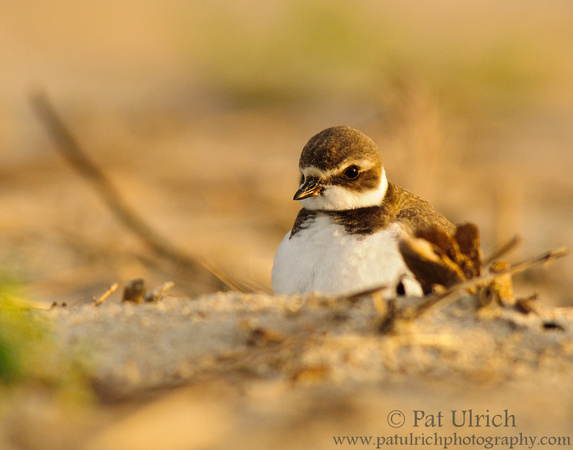 From this trip, I came back with a variety of plover portraits, but the images that stood out the most for me had something cute or different in the background. I suppose some could consider it distracting, but for me, it shows the expression of the birds and gives it a bit more life. While this pose was just the finish of a stretch during some preening, I see a look of pure glee -- sort of fitting for these cute little birds. Here's the more "normal" version of this image. I like this one too, but it doesn't pull me in quite the same way.